My wife and I visited another famous coffee-growing area, the Kona region of Hawai'i, in 2010. There we saw enormous groves of coffee trees, sometimes as far as the eyes could see, on flat or gently sloping land. 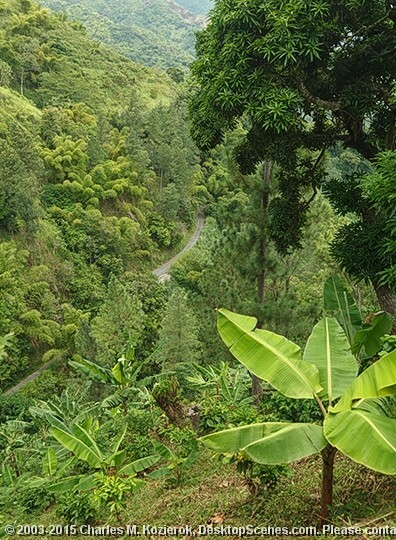 We knew that Jamaica's Blue Mountains were also famous for coffee, but there sure didn't appear to be any wide open areas here for growing it. We figured there must be some flatter areas somewhere, and that's where we'd find the trees. Wrong! There apparently are no huge groves of Blue Mountain coffee trees. Rather, the coffee is planted and grown on steep hillsides scattered all over the mountains, like the one seen here. The coffee is typically interplanted with other species like bananas, for reasons that we were told but I have forgotten. With each coffee tree so spread out and on such steep ground, all of the work of maintaining the plants and collecting the coffee beans is done slowly and laboriously. So now you know: the high price isn't just because it's famous.